Nothing makes a dad feel special like a handmade Father's Day gift from his favorite kids. From simple crafts that kids can make on their own to more involved projects that will require a little grown up involvement, there are lots of fun ideas to try. As you decide on the best project for you, remember to consider the ages and abilities of the children who will be crafting. That way, everyone will have a great time making a unique Father's Day gift for Dad! 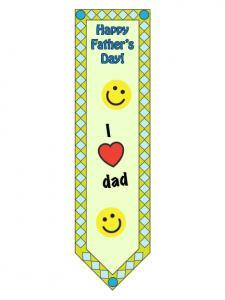 Bookmarks are a special and tangible gift idea for the bookworm dad. 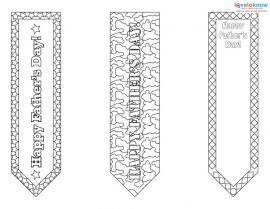 You can use these free printable bookmarks to make a sweet Father's Day gift. An adult will need to help with the laminating, but school-aged children can perform most of this craft independently. Click on the image of the bookmark you'd like to print. For help downloading and using the file, check out these handy tips. Cut out the bookmark you'd like to color. Color the bookmark using crayons, colored pencils, or any other art supplies you choose. Place the bookmark on a sheet of cardstock and lightly trace around it with a pencil. Cut out the bookmark shape you drew on the cardstock. Apply a little glue on the back of the bookmark you colored, making sure you get the glue close to the edges. Line the bookmark up with the cardstock shape and press the two together. Let the bookmark dry. Cut two pieces of clear contact paper slightly larger than the bookmark. Peel the backing off of one sheet and press the bookmark on it. Smooth out any air bubbles. Then peel the backing off the other sheet of contact paper and place this over the other side of the bookmark. Get rid of any air bubbles and then cut around the bookmark about 1/4 inch from the edge. Beaded key chains make excellent and thoughtful gifts, and kids love to create them. Check out your local craft or hobby store, and you're bound to find an abundant supply of pony beads. Add in some letter beads so kids can spell out a special message for Dad. This is a great craft for preschoolers and up, although the small beads mean it's not a good choice for children under three years of age. An adult will need to help a little by securing any knots with a dab of hot glue. Knot a small piece of beading cord around the key ring and secure with a dab of hot glue. It's a good idea to perform this part of the project before involving the kids. Have kids string beads on the cord in any design they choose. They can use Dad's favorite colors, or spell out a message like "Dad" or "I love you." Tie the beading cord around the last bead. Use a little hot glue to hold the knot and trim off any excess cord. Custom T-shirts are an easy craft that dad will cherish for years to come. For a unique and sentimental T-shirt idea, why not have your child stamp his hand prints on a plain white tee with colorful fabric paint? This fun and messy craft is great for kids of all ages, but younger children will need a little help with the hand print. Pre-wash the T-shirt to remove any starch that could interfere with the paint. Pour some fabric paint onto a paper plate. Spread a plastic table cloth or garbage bag on the table to protect it. Help each child dip her hand in the paint and make a print on the T-shirt. Allow the paint to dry. When the paint is dry, kids can go wild with ideas and include written sentiments like "#1 Dad" or "Best Dad in the Universe." Whether or not Dad is a handy guy, it's always nice to have a hammer around the house. Kids can give him his very own personalized hammer by painting the handle. He'll never get his tools mixed up with this eye-catching project. This project is messy, but it's perfect for kids of all ages. Younger children will need help from an adult to control the hammer during painting. To make the paint more durable, an adult can also apply a coat of spray varnish to protect it. Wrap the head of the hammer in painter's tape to keep it from getting painted. Older kids can do this alone, but an adult will need to help little ones. Protect your work surface. Pour various colors of craft paint onto paper plates. Paint the handle of the hammer in lots of pretty colors. Allow one side to dry, then flip it over to paint the other side. Once the hammer is dry, an adult can take it outside and use spray varnish to protect the beautiful paint job. When everything is dry, remove the painter's tape. Sports-loving dads will go crazy for this fun craft, especially if they have several children. 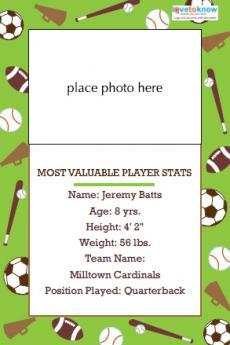 This easy printable option can also work as an annual Father's Day gift, since the "stats" will change over the years. Kids will need to work with an adult to download and print this project. Start by clicking on the image of the sports card to download it to your computer. Add a photograph of your child holding a sporting item such as a baseball bat or wearing a uniform. Enter the relevant information for your child, including name, age, height, weight, and other stats. Print the card on cardstock. If you wish, laminate the card using clear contact paper. Still need a few more ideas? These fun crafts are perfect for kids who want to show their love for Dad. All of these ideas require adult help, but they have plenty of room for kids to be involved in the creative process. While most families take plenty of pictures of the kids, it's not every day that Dad gets a special photo album created just for him. In addition to basic photo albums, consider creating a special scrapbook just for Dad. You can pack it with family pictures and scrapbook paper and embellishments that represent his favorite colors and hobbies. Another option is to create a digital scrapbook for Father's Day by importing photos and printing the pages for free. No matter which type of scrapbook or album you create, this is a meaningful gift that's perfect for kids of all ages. Paint-your-own-pottery shops are common in many large cities, and you can't beat their sentimental bang for the buck. With a vast selection of pottery to choose from, such as coffee mugs, plates, saucers, dishes, popcorn bowls, garden gnomes, steins, and stepping stones, finding a unique and practical gift idea for Dad is easy. 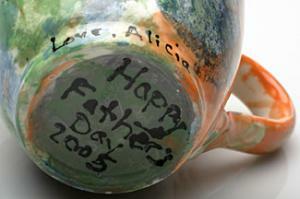 Once you've selected a piece for dad, kids can go wild painting or stamping Dad's pottery, creating a custom piece just for him. Pottery painting studios are generally set up so that the pottery is painted one day and fired in the kiln over the next several weeks. To avoid unexpected disappointments, make sure you contact the studio prior to painting to ensure your work will be completed before Dad's big day. For the garden enthusiast, a simple herb garden or potted fruit tree is an excellent Father's Day gift idea. Children can get in on the fun by planting and selecting the herbs or flowers. To create a custom-themed gift, have the kids personalize a clay pot for the herbs or fruit tree. Add a pair of garden gloves and a watering can for a deluxe gift. A Father's Day card can be more meaningful if it's created by little hands. Instead of buying a card at the store, have kids make a printable card or create a masterpiece from scratch. Either way, Dad will be touched by the gesture. You can show Dad he's the sweetest by giving him some of his favorite candy bars with custom wrappers. 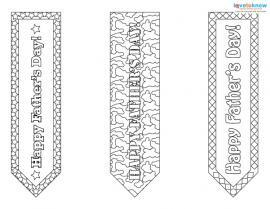 Use free printable templates or wrap candy bars in kids' artwork. Kids can make picture frames using store-bought options and plenty of DIY picture frame ideas. From decoupage to painting, kids can put a creative stamp on the frame. Then they can insert a favorite photo of themselves and give the frame to Dad for his desk at work. Homemade Father's Day gifts are an excellent and often affordable alternative to store-bought merchandise. Not only are handmade gifts packed with sentiment, they're a great way for kids to use their creativity and imagination and get in on the celebration.